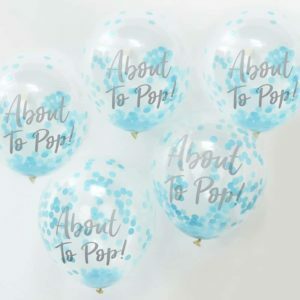 Add sparkle with these gorgeous Blue Confetti filled Balloons. Each pack contains 5 balloons measuring: 12" when inflated. Multi-coloured Confetti Filled Balloons, add colour to your party. Each pack contains 5 x 12" confetti filled balloons. 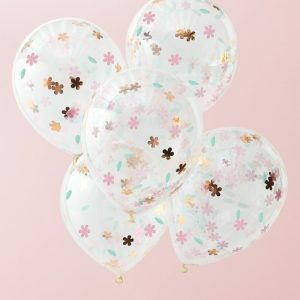 Cute rose gold & pink floral confetti filled balloons. 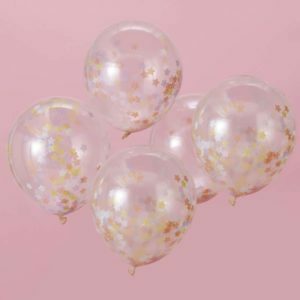 These cute rose gold & pink floral confetti filled balloons are a great way to add fun and colour to your celebration. Pack contains 5 x 12" confetti filled balloons. 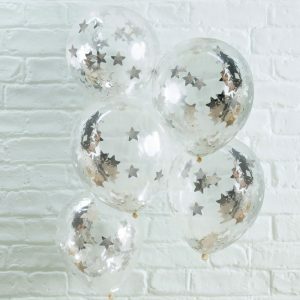 Add twinkle to any occasion with Silver Star Confetti filled Balloons. Each pack contains 5 balloons measuring: 12" when inflated. Fill your party with our 'Iridescent Confetti Balloons' and create a colourful wonderland for your guests. The iridescent confetti inside the balloons will wow your guests! For a truly fabulous balloon blow the balloon up with air and helium. Shake to awake the confetti! 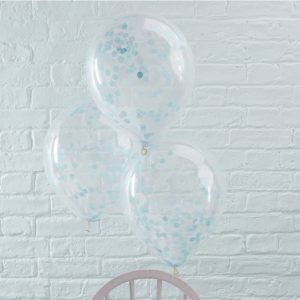 Use with our confetti linking balloons for a marvellous combination. Each pack contains five balloons measuring 12" (Diameter). 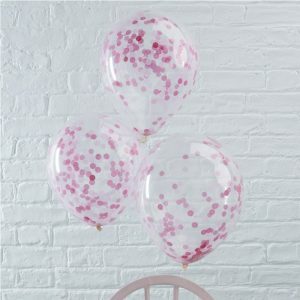 Add a splash of colour to your next party with these stunning pink Confetti filled Balloons! Wow your friends and family with the trendy balloons, perfect for any special occasion. Clear balloons are filled with gorgeous pink tissue paper confetti pieces! 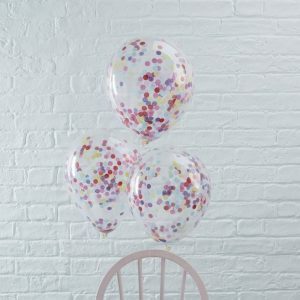 Pick your favourite confetti balloons within the Pick and Mix range and create the perfect party setup by mixing them. 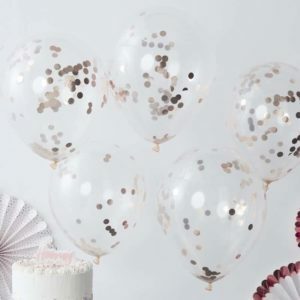 To make the confetti stick to the sides of the balloons best, we recommend inflating the balloons with a mixture of helium and a good of puff of air! Each pack contains 5 balloons measuring: 12" when inflated. 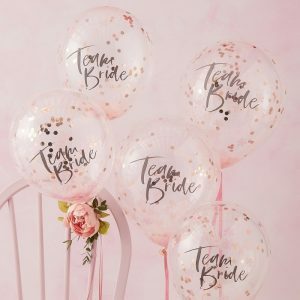 Decorate your venue in style with our 'Rose Gold Confetti Balloons'. Guests will love the rose gold shiny confetti which floats away as you celebrate! A gorgeous balloon for a perfect Pick & Mix party. Inflate the balloons with helium and air. Give the balloon a shake to wake the confetti! Please note string is not included. Combine with the rest of our Pick & Mix rose gold collection for a stunning party set up. 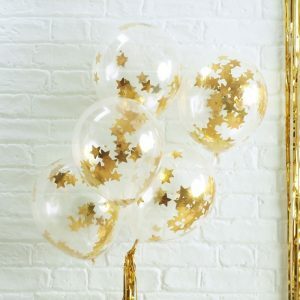 Each pack contains five gold confetti balloons measuring 12" (Diameter). Suitable for helium inflation, please see our range of disposable canisters. 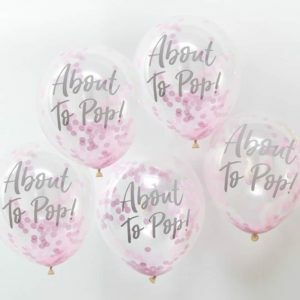 The cutest balloons for an adorable baby shower our 'About to pop' balloon will be a fun finishing touch to your party. Wow the mummy to be and have these dotted around your venue for a dreamy baby shower! Inflate these balloons with helium and air. Give the balloon a shake to wake the confetti! Combine with our tassel garland for an oh baby perfect day! Each pack contains 5 balloons measuring 12" (Diameter). Suitable for helium inflation, please see our range of disposable canisters. 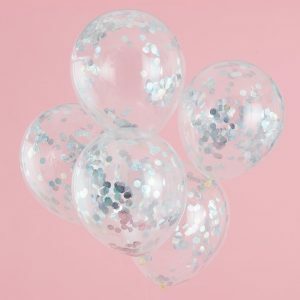 Fill your party with our 'Star Confetti Balloons' and create a mystical wonderland for your guests. Our star balloons will look magical at your celebrations. The pastel stars inside the balloons will enchant your guests - you'll have everyone believing in unicorns! For a truly fabulous balloon blow the balloon up with air and helium. Shake the stars to awake the magic! Use with our 'Marble balloons' for a marvellous combination. Each pack contains five balloons measuring 12" (Diameter). Suitable for helium inflation, please see our range of disposable canisters.